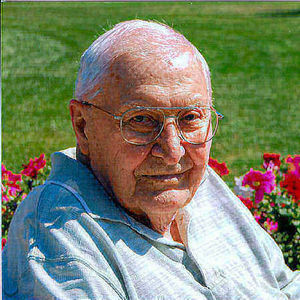 Othmar "OJ" Schonhardt, 92, Wahpeton, ND, formerly Mooreton, ND, passed away, Monday, January 21, 2013, at St. Catherine's Living Center, Wahpeton. The Funeral Mass will be Saturday, 10:30 a.m., at St. Anthony's Catholic Church, Mooreton, ND. Visitation will be Friday, from 5 PM to 7 PM at Willow Creek Chapel, Wahpeton and one hour before the service at the church on Saturday. Interment will be at St. Anthony's Catholic Cemetery, Mooreton. Vertin-Munson Funeral Home is in charge of arrangements. Othmar John Schonhardt was born on September 5, 1920 in Ogema, Minnesota to Rose (Humbert) and John Schonhardt; the eldest of 5 sons. "OJ" grew up and was educated in the Ogema area. In the early 1940's he began working at the Thomas Manikowski Farm in the Mooreton, ND area. On November 21, 1941 he married Alyce Solberg at St. Mary's Church, Breckenridge, MN. "OJ" began his employment at the Mooreton Farmer's Elevator in 1946 and became its manager in 1955. He was extremely dedicated to the farmers in the Mooreton area and spent 37 years serving them with their feed, seed and grain-marketing needs. "OJ" retired in 1983 from the elevator, but continued to pursue his love for agriculture by working for the Link Farms during spring and fall work times. He also worked at the Mooreton Locker Plant (Menne's Store) for several years and mowed lawns for anyone who asked. "OJ" will be remembered in the Mooreton area for his "Hospice" services. He truly personified the service before it came to be known what it is today. He cared for many friends by spending countless hours caring for and comforting them into their final days. "OJ" was later repaid with similar kindnesses by neighborhood friends Doug and Louise Olson, who cared for him in his home until he entered St. Catherine's Living Center in Wahpeton. Among his many interests; his love of fishing, hunting, traveling, story telling, cooking and young children. Although recent strokes prevented him from verbalizing all he had wanted to say, the smiles he gave spoke volumes about his spirit and his peace with God. "OJ"s family would like to thank Dr. Duane Strand, the staff of St. Francis Healthcare, the staff at Prairie Vision and most especially the entire staff at St. Catherine's Living Center for the compassionate care "OJ" received over the past several years. Their kindness will never be forgotten. Left to mourn his passing are his children; Darlene (Larry) Rowlett, Columbia, SC, Shirley (Bob) Ferguson, Lakota, ND and Tim (Sue) Schonhardt, Fergus Falls, MN, 5 grandchildren and 5 great- grandchildren ;Jeff (Brooke) Rowlett and Lily, Charleston, SC, Dan (Naomi) Ferguson and Brandt and Beau, Lakota, ND Lee (Amanda) Ferguson and Coltyn and Hannah, Fargo, ND, Charlie (Andrea) Schonhardt, Bloomington, MN, Ryan (Amanda) Schonhardt, Hoffman, MN and Kayla Schonhardt, Minnetonka, and one brother, John Schonhardt, Anoka, MN. He was preceded in death by his parents, his wife Alyce on April 1, 2001 and 3 brothers. The beautiful and interactive Eternal Tribute tells Othmar's life story the way it deserves to be told in words, pictures and video. We were sad to see on this website, about the passing of your Dad. We knew he had not been well for a while, but it's always difficult to lose your parent no matter how old you are. He was such a nice man, he always had time to talk and pass on his knowledge. Mark say's, "he was probably the most community minded person in Mooreton, he would help with anything and everything. He loved to cook and was a great cook. He was a great asset to the Sportsman's club and Mooreton Community Club" and did it without any other agenda". Take care, and please accept out deepest condolences. My deepest sympathy to a wonderful family. God Bless you all! Eternal rest to you. I always knew you as my cousin BUTCH. I was the flower girl in your wedding.You left us with many good memories.O J you were a gem. Ryan & Family, Your Grandfather must have been a wonderful man. Hold tight to all your memories. Our prayers and sympathy to all of your family. Dear Family of "OJ": We have so many fond memories of OJ. He was a great man and will be missed dearly. God Speed OJ!